What this means is that, if an object is placed at a distance u along the axis in front of a positive lens of focal length f, a screen placed at a distance v behind the lens will have a sharp image of the object projected onto it. When Object distance, u > 2*f, the lens is used by camera when forming images on film and the eyes. 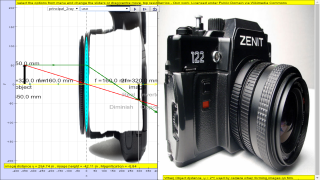 When Object distance, u = 2*f, the lens is used by photocopier when making equal size copies. When Object distance, f < u < 2*f, the lens is used by overhead projector to form magnified image. When Object distance, u = f, the lens is used by spotlight when projecting parallel beam of light. When Object distance, u < f, the lens is used by magnifying glass when viewing a enlarged image. where M is the magnification factor; if |M|>1, the image is larger than the object. Notice the sign convention here shows that, if M is negative, as it is for real images, the image is upside-down with respect to the object. For virtual images, M is positive and the image is upright. Please note that the shape of the lens adjust with the focal length is for illustration purposes, it is not scientific. Lens that is controllable by the focal length f, +f imply converging lens -f imply diverging lens. v is position of Image from lens center c.
dynamically display a possible use of the lens under different conditions with pictures shared under creative commons licenses and other similar pro usage licenses under attribution. Auto-scale: to allow visualization view of images formed outside designed screen view. Explore the simulation. Notice that you can move the sliders to vary the distance of the object to the center of the thin lens. What do each of the sliders, radio buttons and check-boxes do? Discuss with your lab partner what is the meaning of the focal length f.
hint: in terms of the way the light rays from the object is bend and pass through where? What does the green ray light always do? What does the red ray light always do? What does the teal ray light always do? hint: in terms of the way ray light traveling parallel to and passing through where etc? What does the term linear magnification mean in this simulation. Discuss how it is calculated from? How many ways are there to determine the magnification of the think converging lens. By definition, focal length is the distance between the point in the lens where the light begins to diverge (the nodal point) when the object is set at infinity. Describe (to tell or depict) how light behaves when it passes through a thin converging or diverging lens. Define (to state the meaning) the term focal length for a thin converging lens. Draw (to sketch accurately) ray diagrams to illustrate how real and virtual images are formed by a thin converging lens.